Does that describe your daily Bible reading? Do you have a desire for a meaningful Bible study? He returned from a missionary trip and had a life changing Holy Spirit encounter. His desire for God inspired him to read the Bible differently. He began reading the Bible systematically. Each day his enthusiasm for Bible study grew as he became more focused and the Bible revealed its mysteries to him. He used his love for the Bible and his background as a teacher to write this useful guide, Focus Braintrainer with the Bible...for you to have a focused, meaningful and with insight Bible study. The ten questions in each chapter will guide your daily Bible reading alongside the King James or New King James version of the Bible. Your Bible reading becomes more focused because you know there are questions to answer. A helpful tip is to read the questions beforehand to give your reading a clear direction. You read with focused attention when you search for the answers in the Bible passages. Your note taking will become clearer as you summarize the Bible chapters when answering the questions. Your understanding of the Bible passages increase as the mysteries of the content is revealed. You draw closer to God when you study His Word. By reading the Bible focused, you get to know Him better. In addition to a blessed daily Bible reading, your reading skills will improve and your enthusiasm to discover God’s message will grow daily. 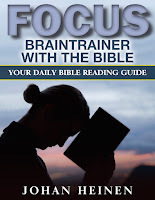 Johan Heinen invites you to join him in a systematic and focused Bible reading plan. I am convinced you will read your Bible better and will be more blessed in reading it. Try it out. Why wait, start now to read the Bible with focus, insight, and understanding. This book is now available for Kindle. For 3 limited days you can obtain it for free. The first day is Sept. 9 and the last day is Sept 11. Make use of this offer and rewards others with your review at Amazon, so they become inspired to read the Bible. In Africa, there is great demand for useful biblical material. The purchase of such material is, however, too expensive for a large percentage of the population. Importantia Publishing would like to provide a free, professional build Online Bible module of La Bible Crampon 1923 for all French speakers around the globe. The costs involved to make this happen is € 200,-. We collected already resources through crowdfunding and are reaching our final goal. Help us to make this La Bible Crampon available for the French-speaking Online Bible users in Africa and beyond. Most of the work is done by volunteers, but there remain some costs we have to make. Support this project with a donation of 5, 10, or 15 Euros or more. You can donate in Dollars as well.